Native American and Somali communities in Minneapolis have lived close to each other ever since the first refugees of war-torn Somalia began to arrive in the early '90's. The attraction of jobs and services in the cities has been offset by the conflicts that have arisen between Native and Somali youth. Assault and sexual abuse have been reported in the past, and members of both communities have voiced concern about the safety of their neighborhoods. A high profile crime in January of last year brought the issue to the wider public. Violence, human trafficking, and housing placement are just some of the issues facing both Natives and Somalis in Minneapolis. To stop the violence, and begin a dialogue between the two communities, the Native American Somali Friendship Committee (NASFC) was formed. "It was really a series of linkages," says Terri Yellowhammer, an Indian Child Welfare Consultant and a member of the Standing Rock Sioux Tribe. "There was an email sent out expressing anger over a Native woman who was attacked. I forwarded it on to other community workers and the idea to get together started." Kristin Berg Thompson, a Minneapolis Public Schools Liaison, responded to the email. "I read this letter, and thought, 'Ok, what do I do with this?' I talked to Terri and asked if I could help. I wanted to bring members from both communities together and so I sent the email on to members of the Somali community." One of those contacted from the Somali community was Yusuf Ahmed, a worker for the City of Minneapolis, and community organizer. He saw an opportunity for dialogue. "Basically what happened was we had all received this mail about what was happening in the city, and we wanted to change this for the better. There are a lot of similarities between Native American and Somali culture, so when we came together I asked, 'how can we live better together as Americans?'" A simple email sparked members from both communities into action. Wade Keezer, an Ojibwe community activist and author of the letter that brought the NASFC together, thinks about how the board came about. "I didn't expect so much to come back to me. I didn't know what was going to come. But the responses started coming in, and I was overwhelmed a little bit," said Keezer. 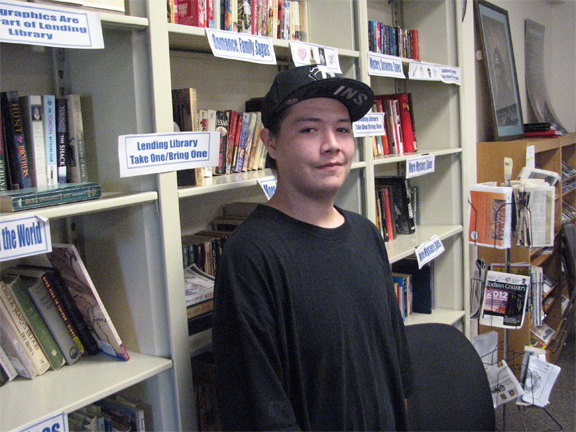 "We started about a year and a half ago," Keezer says, "it was brought up to me by an elder in the community. He was talking about how elders in the community were being treated poorly by Somali youth. He asked if something could be done about it before it goes too far. I thought about the problem and listened to others. I started hearing stuff like Native youth were doing the same thing also out there. Well, you can't just sit back and do nothing, so we [NASFC board members] got together and said 'this is our chance to do something about it.'" The board had their first meeting on Martin Luther King (MLK) day in 2010. The original group was small, consisting only of Keezer, Berg, Yellowhammer, and Ahmed. This February, they had a potluck to celebrate their one year anniversary. In that time, the board has worked with both Native and Somali youth groups and organizations, volunteering their time and energy to bridge the gap between the two communities. "We quickly realized that if we focus on negativity we're not going to get anywhere," Keezer said. "We meet once a month, and there have been a lot of people. But, there is a core group of people who have stayed with us the whole time." Amina Saleh, who works at The Family Partnership on 414 South 8th Street, is a Somalian community organizer who has worked with the NASFC since nearly the beginning. "Amina Saleh said we should start looking at this from a cultural perspective," Keezer says, "Amina has been passionate about this from the get go. Her energy and output is highly commendable and respectable." Saleh describes her own involvement with the organization. "There was some hesitation, nervousness about coming together at first… we thought we should have it in a neutral place, you know? So we met in a coffee shop, and then we alternated between one meeting at my partnership, one meeting at the Minneapolis American Indian Center (MAIC)." Saleh said. "I had heard of the problems from the youth; people coming into my workplace talking about the issues on the street. So at The Family Partnership, we asked, 'what can we do?' We took all of the complaints, so that we could bring them together and talk about it." "People who are terrified of the situation are Somali and Indian. It goes both ways. The good thing is both Somalis and Indians listen to our elders. So when they see Native and Somali elders walking together, the youth think, 'this is good!'" Saleh said. The problem right now for NASFC is funding. Some of the programs the committee has planned, like an open gym for the youth to spend time together in, or their plans for summer camps, cannot be done without financial backing. Grant work is the most effective way to meet these needs. NASFC recently competed with similar organizations for the In Commons Challenge, a community grant worth up to $25,000. NASFC wasn't awarded the grant but were told they came in second out of the 223 organizations that applied. Keezer brings the conversation back to the committee and its goals. "Instead of trying to create something new, we're trying to integrate the program we have with what's already here, especially when it comes to youth. We want to sit down and learn from each other. So funding would be helpful, but we're also hoping we'll find support from other organizations in the area, too." "And it's not just here [in the cities]. I've gotten reports from reservations up north. In Duluth they were asking about meeting with Somalis and making this situation better. [Somalis] were going to winter retreats and our people would show them what Ojibwe traditions are, what's important to us." The board has heard suggestions of bringing Somali youth out to Minnesota's lakes and rivers and showing them the wild rice harvest, or involving them in making maple sugar. "We have many tribes from which we can [learn from] in Minnesota," Keezer says. "We want to show the Somali youth our culture, and we want to be open to things they can show us. There are even Native and Somali theater opportunities we're looking into." Saleh is quick to describe some of the possibilities her Somali culture can share with others. 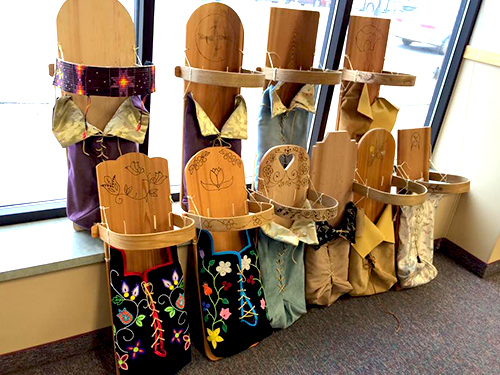 "We have talked at our past meetings about bringing our elders in and showing the Native youth how to draw with henna, a plant used for ink and hair dyes." "This organization is a partnership between the Native and Somali communities." Saleh said, "We are all neighbors here. We are all Americans now. We should see how best we can live together." Keezer adds, "Something has to be done, these problems won't solve themselves. You know, we're not all going to get along, it's just impossible. But even if you can't get along, you can have an understanding [of others]. At least then you don't have to be paranoid walking down the street. The Somalis… have been through conflict and war. Who better to walk with them than Native Americans?" ords he spoke, he talked about everybody, and that's what we're trying to do in our group, is to include everyone." 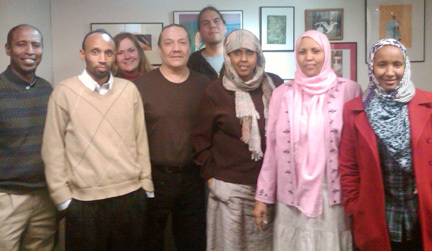 NASFC encourages people interested in the Native and Somali communities to attend their meetings. If interested, the next committee meeting will be held on March 28th, from 5 pm to 7 pm at the MAIC at 1530 E. Franklin in Minneapolis.